We are able to provide better lead times than most others selling similar products online. This is due to the fact that Lindsey Doors is the direct manufacturer of the products we sell. We are not a middleman. We will begin the production process as soon as your order is placed and approved. Typical approval times range from 24-48 hours. After your order is approved, the general lead time to produce your custom order is between 5-10 business days (depending on the scope of your order and the number of pieces ordered). Once your order has been fully-produced, every piece will be check for quality, securely packed, and shipped with one business day. Lindsey Doors uses the top shipping carriers available. Depending on the size of your order, you’ll receive your order from either FedEx, UPS or a freight carrier. If your order is over $500, we require signature confirmation in order to deliver. If your order total is $1500 or above, you will receive free standard shipping. If you order is below $1500, the price of shipping will be calculated based on the total weight and shipping options available in the cart. You may also pickup your order at your will-call area, located in Indio, CA. If you choose to pickup your order at will-call, you will receive instructions via email on how to do so once your order is ready. The duration of shipping depends on the shipping method selected. If your order total is $1500 or above, you will receive free standard shipping. The duration for free standard shipping is 5-7 days once shipped. If your order total is below $1500, the shipping duration will depend on your shipping location in relation to Indio, CA and the shipping carrier you select. Shipping durations can range from 1-5 days using UPS Ground. 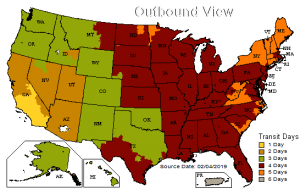 The graphic below indicates the shipment duration time for UPS Ground based on shipment originating in Indio, California. Subject to the Tariff/Terms and Conditions of Service, UPS guarantees on-schedule delivery of packages, shipped via UPS’s services, that are listed as guaranteed, or will refund your transportation charges. Guaranteed Service is not available in all areas and does not apply to shipments containing a package with an Additional Handling or Large Package surcharge. Scheduled business days and delivery schedules are revised occasionally due to changes in distribution and volume, especially during holiday periods. Service to some remote areas also may require additional delivery days. For current delivery schedules, service availability and information, and a description of the UPS service Guarantee, see the UPS Rate and Service Guide. The most up-to-date transit time details will be available at ups.com/ctc at the time of shipping. Certain commodities and high value shipments may require additional transit time for customs clearance. If you receive any damaged items you must report them to us within 48 hours. Once you report a damage shipment, we will respond within one business day on how to proceed. In most cases, we will ask that you send us photos of the damaged good(s) so we can file a report with our shipping insurance carrier. Once the damaged good(s) have been confirmed by our office, we will remake the damaged items and ship to you at no cost. We currently only ship to the lower 48 continental states and do not ship to Alaska or Hawaii. Additionally, for all wholesale orders placed with Lindsey Doors, there may be additional shipping and delivery terms and supersedes the terms herein. Lindsey Doors is a leading manufacturer of rigid thermofoil cabinetry products including cabinets doors, drawer fronts, trim, molding, laminates, wine racks, corbels and valances. We’re based in the Coachella Valley city of Indio, California and ship our cabinetry products nationwide. Copyright © 2019. Lindsey Doors Inc. All rights reserved.